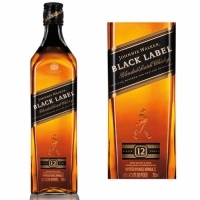 Experts consider Black Label the gold standard of the whisky blender's art. Johnnie Walker has the luxury of exclusive access to Scotland's very best whiskies, ranging from the powerful west coast malts to the subtle whiskies of the east coast. Black Label draws upon all of these notes, culminating in a smooth blend of incredible complexity and character. A rich blend of over 40 whiskies at least 12 years of age, it can be enjoyed on the rocks, neat, or with a dash of water. For occasions big and small alike, Johnnie Walker Black Label has long been the perfect celebration of the next step.